Anna Janzen (1868–1945) was the daughter of industrialist Jacob Wilhelm Janzen (1845–1917) and Helena Unrau (1847–1917). Anna was born in Andreasfeld, Chortitza, on 23 June 1868. She married Kornelius Neufeld on 26 June 1891 in Serjejewka, Fuerstenland. They had eight children, two of whom died in infancy. Kornelius Neufeld (1869–1917) was the son of Abram A. Neufeld (1820–1876) and Helena Unrau (1834–1898). Kornelius was born on 26 May 1869 at the Neustaedter Estate, located between Einlage and Ekaterinoslav, where his father Abram worked as a miller. His father died in 1876 of diabetes in Steinfeld Schlactin, a new farming settlement to which they had moved. Their farm, 135 acres, was sold for 50 rubles and the family sent back to where they had come from. Some years later, in 1889, Kornelius's older brother Herman took him to Serjejewka, Fuerstenland, where Kornelius started to work in the Janzen-Klassen farm implement foundry. In 1891, he married the Janzens' daughter Anna and was eventually promoted to management of the factory. After the Janzen-Klassen partnership broke up, Kornelius and his father-in-law formed a new foundry and machine shop. Peter Neudorf (b. 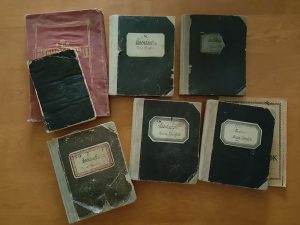 1935) of Vancouver transcribed/translated the Anna (Janzen) Neufeld letters and journal books over a period of nine years (see image at left showing Anna's diary/journal books). Peter's wife Helga (Peters) Neudorf (1937–2017), the granddaughter of Anna (Janzen) Neufeld, edited and proofread Peter's translations. Hildegard (Peters) Isaak (b. 1933), another granddaughter, inherited the journals and donated them to the archives in 2018. The other grandchildren are Helmut Peters (b. 1935) and Hedy (Peters) Pletz (b. 1942). The original letters still remain in the possession of the family. About the translations, Peter writes: "I began the translation project with about 70 letters, the first one written by Kornelius in 1890 to his brother Herman in Nikolayevka. Starting in 1916, his wife, Anna Janzen, kept a diary, writing almost daily. She produced eight journal books in total; two were destroyed. For the first diary (321 pages) and the letters, I transcribed the text from Gothic script to English script and then translated the transcription into English. Eventually, I translated directly from Gothic to English. I started the project in 2009 and sent the first letter translations for the family—Helga's siblings—to read on 28 December 2009 and the last one on 11 August 2018. "Having been a technician with IBM for over 30 years, the word 'can’t' was rarely in my vocabulary. On occasion, I would spend up to three days on a particularly difficult word, that is, a couple of hours a day, and then I typically came up with an English translation. Some Ukrainian words I could not transpose and I left them as Ukrainian. I want to give credit to my wife, who, as long as she was able, proofread and corrected my grammar. I thank Helmut Peters, her brother, for taking over after her passing. "Anna's diary accounts give evidence of enjoying incredible wealth and then of experiencing the total loss of everything following the Russian Revolution (see image at left of her diary/journal page dated 1 January 1921). There is the narration of her husband's appendicitis operations and ultimate death in 1917. The family, minus father, managed to flee to Germany on 23 November 1918 from their large home on the factory compound, traveling by train with the retreating German soldiers following the end of the First World War. Then there is her daughter's death—also of appendicitis—after needing to be left in Halifax as they immigrated to Canada in January 1922 following a three-year stay in Germany. Also moving is the humbling experience of having to live by gifts from kindhearted Germans when the family's money ran out and Germany faced massive inflation. "Anna was clearly a person that always needed people around her. Her diary describes many visits with friends, and yet there are regular expressions of loneliness. Still, the message that comes through almost daily in the entries is her conviction that God cares and will provide." Hildegard (Peters) Isaak, granddaughter of Anna (Janzen) Neufeld, donated the original diary/journal books to CMBS in the summer of 2018 (Acc. no. 2018-08). Transcriber and translator Peter Neudorf donated digital copies of his German transcriptions and English translations of the letters and journal entries at the same time. Peter Neudorf spent about nine years on the transcription/translation project, starting in 2009. He was assisted by his wife, Helga, another granddaughter of Anna until Helga's passing in 2017. Helmut Peters, the grandson of Anna also helped with translation verification. The original letters remain in the possession of the family. This fonds documents through letters and journal entries the life of a particular Mennonite factory family, as they experience loss due to the Russian Revolution and First World War, emigration from Ukraine, eventual liquidation of their assets, and the challenges of starting life over in a new country. It includes English translations of some 70 letters written by Kornelius A. Neufeld dated from 1890 to 1917, as well as English translations of Anna (Janzen) Neufeld's diary/journal books dated 1916 and 1919 to 1925. Described by Jon Isaak, September 2018. See published version of one diary entry, Peter Neudorf, "The Ordeal of an Appendicitis Attack in 1916," in Roots and Branches, Periodical of the Mennonite Historical Society of BC, vol. 23, no. 3 (September 2017), 19–22. 11. Friend autograph book belonging to Anna (Janzen) Neufeld with inscriptions from friends in 1918, the eve of their departure to Germany. -- 1918. 12. 321-page diary/journal book, known as Journal Book No. 1. -- 1916. 13. Journal Book No. 4 (Nos. 2 and 3 are lost). -- 1919. 14. Journal Book No. 5. -- 1919–1920. 15. Journal Book No. 6. -- 1920. 16. Journal Book No. 7. -- 1921. 17. Journal Book No. 8. -- 1921–1925. 19. Digitized copies of letters written by Kornelius A. Neufeld. German transcriptions and English translations. -- 1890–1899. 20. Digitized copies of letters written by Kornelius A. Neufeld. German transcriptions and English translations. -- 1900–1908. 21. Digitized copies of letters written by Kornelius A. and Anna (Janzen) Neufeld. German transcriptions and English translations. -- 1910–1920. 22. Digitized copies of journal/diary entries written by Anna (Janzen) Neufeld. English translation of Book No. 1 and part of Book No. 4. -- 1916, 1919. 23. Digitized copies of journal/diary entries written by Anna (Janzen) Neufeld. English translation of the rest of Book No. 4 and part of Book No. 5. -- 1919. 24. Digitized copies of journal/diary entries written by Anna (Janzen) Neufeld. English translation of the rest of No. 5 and Book No. 6. -- 1920. 25. Digitized copies of journal/diary entries written by Anna (Janzen) Neufeld. English translation of Book No. 7 and part of Book No. 8. -- 1921. 26. Digitized copies of journal/diary entries written by Anna (Janzen) Neufeld. English translation of part of Book No. 8. -- 1922. 27. Digitized copies of journal/diary entries written by Anna (Janzen) Neufeld. English translation of the rest of Book No. 8. -- 1923–1925. 28. 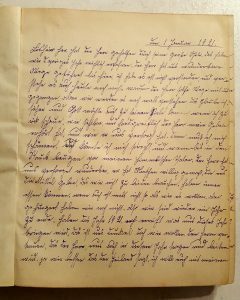 Digitized copies of German transcriptions and English translations of two documents written by Liese Cornelia Neueld Peters, Anna Janzen's daughter: "The Life Story of my Father Kornelius A. Neufeld" and "Memories in the Life of Liese Cornelia Neufeld Peters." -- 1979. 29. Letter from Liesa (Neufeld) Peters bequeathing her mother's journals to her oldest daughter, Hildegard (Peters) Isaak. -- 1981. 30. Complete list of all letters and journals in the fonds transcribed and translated by Peter Neudorf, a collection that totals 744 PDF pages. -- 2018.